This kit is a great selection if you just want a no nonsense easy to install kit to keep your stuff cool. We paired 2 silent 5 volt fans with an AC adapter so you can power it from a standard wall socket or any entertainment device that has an outlet. These Oak finished grills are ready to install. They come with a sealed finish for long lasting quality appeal. Can be mounted on any side of a cabinet, where room permits. Insert completed cooler assembly in hole and attach to cabinet with appropriate screws. 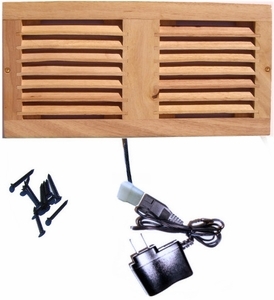 Fans can be set to blow into or out of the cabinet depending on your needs. All necessary screws, cables, and fasteners to complete the unit.